Welcome to our school website. This is designed to give you an insight into the exciting place that is Petersfield Church of England (Aided) Primary School. We very much look forward to welcoming you into school soon to find out even more. 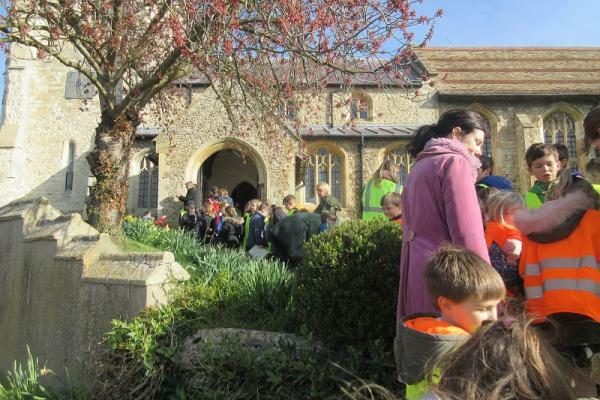 Petersfield Church of England (Aided) Primary School is a small, rural school serving families from within the parish boundaries of Orwell, Arrington, Croydon, Tadlow, Whaddon and Wimpole and from many other locations outside of our school catchment. We are committed to providing a high quality education within a Christian context and we work hard to create a caring environment, both inside the classroom and out. By focusing on excellence, enjoyment, perseverance and building relationships we support and inspire our pupils throughout this stage of their lifelong learning journey. Our 2017 Ofsted report recognises many of the school’s great strengths, particularly in relation to the good start the children make in the Early Years Foundation Stage, keeping the children safe, the caring ethos, behaviour, relationships and the strong leadership and management of the school. The report identifies that Petersfield is a ‘well-organised and improving school in which pupils are well cared for and develop confidence in their learning’. We are very proud that the children at our school are so caring, well behaved and respectful. School leaders have clarity of vision, drive and ambition for the school, founded on the Christian ethos. Pupils demonstrate significant strengths in their social, moral, spiritual and cultural development. Imaginative and challenging RE teaching ensures pupils of all abilities are engaged and high standards attained." "Relationships are exemplary, modelled by adults and particularly strong between older and younger pupils through the 'buddy' system. Staff have high expectations of pupils which is reflected in the progress they are making in their workbooks. The school's values are clearly stated and recognised by all stakeholders. Excellent links have been established with the community, including with the Parish Church. There are significant strengths in teaching and learning in RE at Petersfield. Teachers use imaginative approaches to engage pupils of all levels of ability. A high level of challenge is evident in the 'big questions' explored across the age range. Leaders, including the incumbent and the chair of governors, have the vision, ambition and drive required to secure future success. SMSC is strong and the emphasis placed on this by school leaders is recognised and much appreciated by parents. The articulate, thoughtful and open-minded engagement of pupils in discussions with each other and with adults is testimony to the effectiveness of the leadership of Petersfield CEVA Primary School." We very much look forward to welcoming you to Petersfield where, as partners in learning together, we strive to provide the very best for each individual. Karen Gwynn and Laura Penrose, Co-Headteachers.